Mine weren't too off the mark but just weren't as clear as the samples. I created my own pretty paper by stamping the flower in purple posy and the leaves in pear pizzazz on whisper white (5 1/4" x 4"). I then stamped 3 more flowers on another sheet of whisper white plus 3 more leaves. I fussy cut one flower completely, the next one I cut moving in one layer of petals and the final one I simply cut out the middle. I layered them together with dimensionals and added 3 leaves to the flower by adhering to the bottom layer. 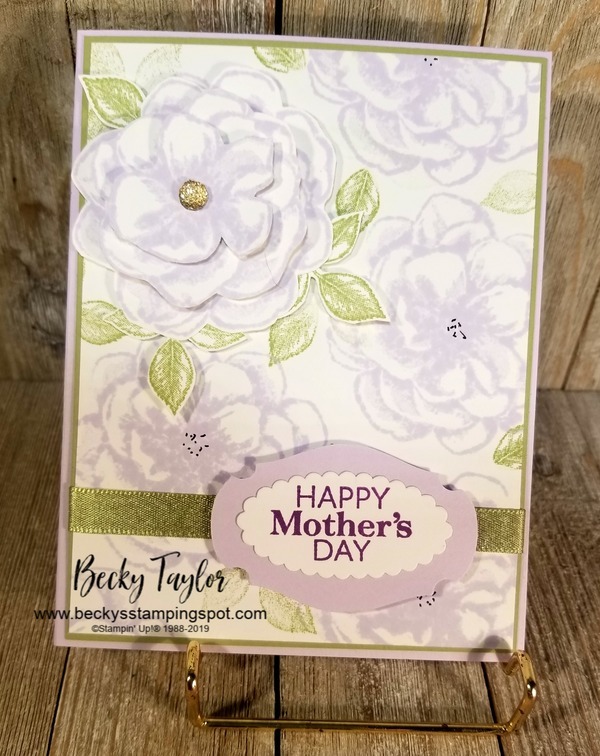 I added a gold faceted gem to the center and made centers of the stamped paper flowers using the Basic Black Stampin' Write Marker. 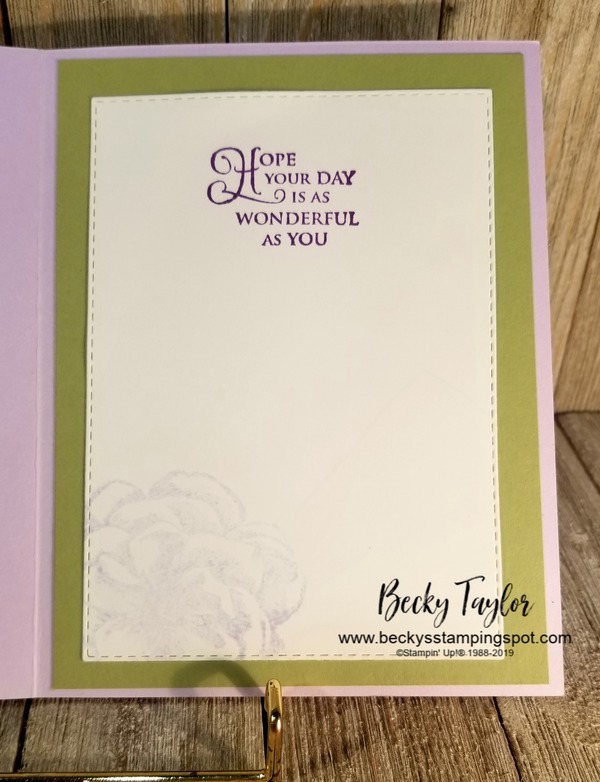 The sentiment on the front (from the paper pumpkin kit) was stamped in gorgeous grape on whisper white and die cut with the layering ovals. I layered that on a label of purple posy punched with the Story Label punch. I wrapped a piece of Pear Pizzazz Shimmer Ribbon around the card front and added the sentiment label with dimensionals. Pear Pizzazz: 4" x 5 1/4"; 4 1/8" x 5 3/8"
For the inside, I diecut the whisper white and stamped the sentiment from Golden Afternoon in Gorgeous Grape. then I stamped off the flower in purple posy in the bottom corner. 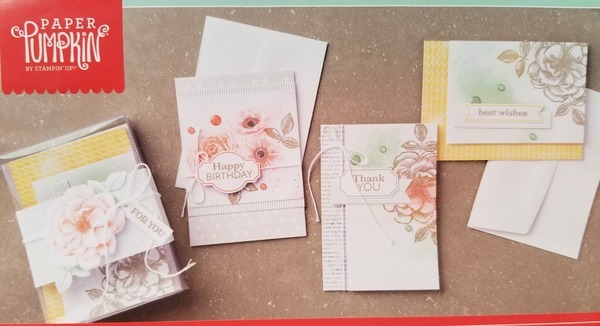 If you are a Paper Pumpkin subscriber, this shows how you can continue to use your exclusive stamps once your kit is complete. 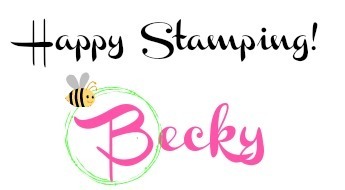 Next month we're getting a kit designed by Shelli Gardner, the co-founder of Stampin' Up! You won't want to miss out on that! You can subscribe here (be sure and subscribe before May 10 to get this kit with its pretty box).